The Raymarine A60, another unbiased chartplotter fishfinder combo review. The Raymarine A60 system pack ships with the display unit, DSM25 black box sounder, RS12 GPS sensor, and a Navionics Silver All-in-One map card. The display measures 9.6 inches wide, just under 7 inches high, and 3.4 inches deep. We mounted the display head on the supplied metal bracket. Connections for power, GPS sensor, transducer, NMEA 0183 data are all through twist lock connectors on the back panel. By removing a rear panel bezel the A60 can be flush-mounted with supplied hardware. Satellite changes made last year have rendered the Raymarine RS12 GPS sensor incapable of receiving WAAS signals; it remains fully functional as a GPS receiver, but lacks WAAS accuracy. An upgrade to the Raymarine RS125 GPS sensor would cost approximately $300, requires some minor wiring modifications, and would restore WAAS capability to the A60. The Raymarine A60 has a 5.7 inch screen with a landscape layout and a resolution of 320 x 240. This made fine details tricky to read when the range setting resulted in a display cluttered with lots of information. Sunlight visibility was also hindered by a lack of selectable color palettes, high screen reflectivity, and less screen brightness than some of the best units this size we’ve tested. We rated the Raymarine A60 display screen only fair for day viewability. Color choices when viewing a chartplotter page are limited to changing some areas of water to white or light blue. When looking at a fishfinder page numerous color choices are available. We noted that the A60 screen darkens when viewed from side angles, as the angle steepened the darkening increased. No screen fogging was noted during our testing. Backlighting on the A60 screen can be controlled between 5% and 100% in 5% increments and the standard map color palette seemed to be better for night viewing. This resulted in a good for night viewability. Dedicated push buttons for page selection and waypoint functions plus five soft keys with page specific functionality earned the Raymarine A60 an excellent rating for chartplotter user interface. We found this unit’s functions and menus very easy to navigate and use. Hitting and holding the MOB key takes the A60 into man overboard mode. This single button push will generate an audible alarm and switch you to a page with chart/highway/data displayed in a split screen with navigation information directing you back to the MOB point. We think the Raymarine A60 has the best MOB function of the tested units. A waypoint is saved at the present position with two pushes of the Wpts/MOB key or you can push it once then use a soft key function to save the position at the cursor, vessel, or present position. If you select vessel, a waypoint is created and soft key labels switch to editing functions. You can edit the symbol, name, lat/long, or comment with the push of a soft key. Waypoint identification can include one of six symbols, up to a 16-character name, and a comment up to 34 characters long. The unit will store up to 1,000 waypoints. Navigation to a waypoint displayed onscreen is a simple matter of placing the cursor over the point then hitting the Go To Waypoint soft key. This draws a course line to the point and lists your bearing and distance onscreen. Tracking to a point in the waypoint list is done by hitting the dedicated waypoint pushbutton, selecting waypoint options, line selecting the specific point, then hitting the Go To soft key. Pretty easy and intuitive in our opinion. Route construction begins with the Route soft key. Once pressed you get several route related options, one of which is New Route. Press it, then simply move the cursor and press the Add Waypoint soft key for each point in the route you’d like to add. When done, press Save Route. It’s easy. Routes can be named and shown on screen on specific colors. Up to 495 routes can be stored. This Raymarine chartplotter combo uses a black box sounder to provide fishfinder data. You can read our full review of the Raymarine DSM25 black box sounder here. Chart redraws on the A60 can be slow. For us it took as long as five seconds to fully redraw all data after a long range change. Chart orientation on the Raymarine is selected via soft key after pressing the Presentation soft key. A label at the top of the map page lets you know what mode of operation you are presently in. The unit tracked a course properly during our testing. Tide and port service information is accessed by placing the cursor over an area, hitting the Enter key, and then hitting the Find Nearest soft key. An option list then lets you choose port service, tide station, or current information. 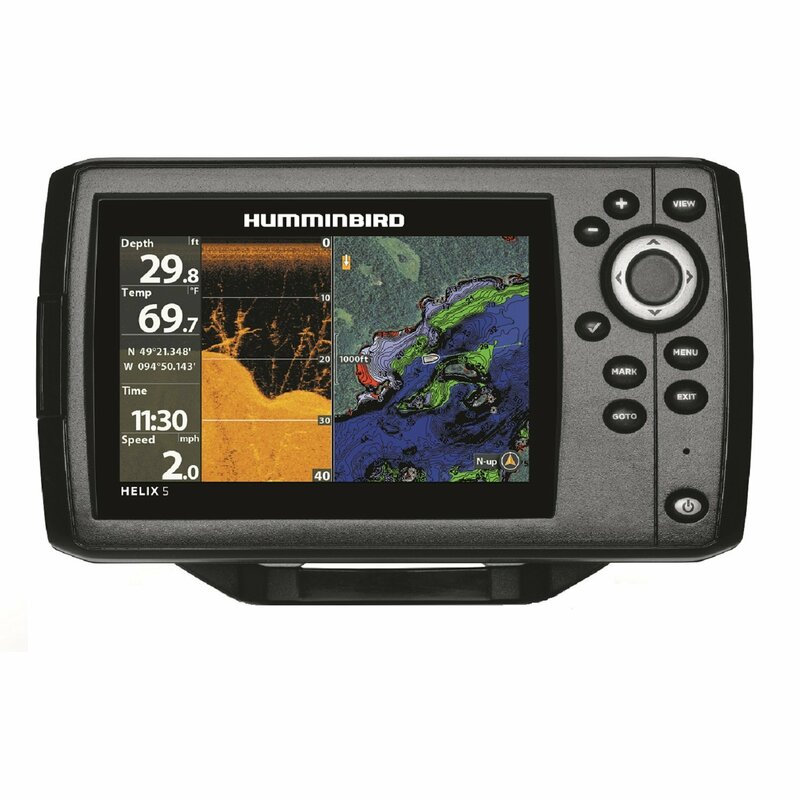 Both the display unit and DSM25 black box fishfinder are waterproof to IPX7 standards meaning they will survive submersion to a depth of one meter for 30 minutes. This Raymarine unit carries a 2-year warranty. The Raymarine A60 and DSM25 combination has superior software and sounder hardware. We found the system very easy to use.